Rusty Rudder just celebrated its fourth anniversary of serving up quality seafood, barbecue, burgers and seasonal salads to hungry patrons, and this community gathering spot shows no signs of slowing down. 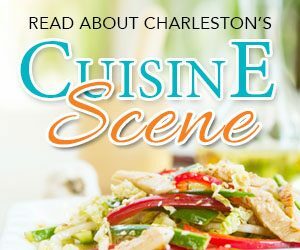 Owners Brian Johnston and Eric Paul live in Mount Pleasant and manage the restaurant, which is located on Highway 17. You can always find one of them on-site, socializing with patrons, running the kitchen or keeping busy in the office. The restaurant, staff and guests are truly like family to them. “We really like to think of the Rudder as a laid-back neighborhood restaurant that serves 5-star, chef-created food,” said Johnston. 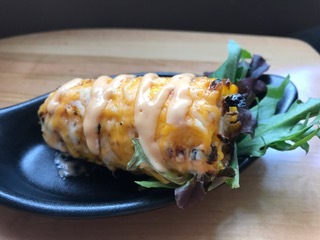 The talented individual behind this culinary wizardry is Mike Eckert, Rusty Rudder’s executive chef since spring 2017. Eckert specializes in experimentation, enjoying nothing more than taking tried-and-true dishes and transforming them into rediscovered entrées, with a fresh and local focus wherever possible. 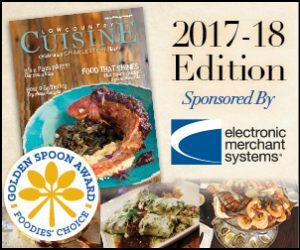 “He’s always tweaking and perfecting his dishes and surprising us with new ones,” remarked Johnston of Eckert, a former executive chef of The Boathouse at Breach Inlet who has more than a decade of experience working in high-volume restaurants. 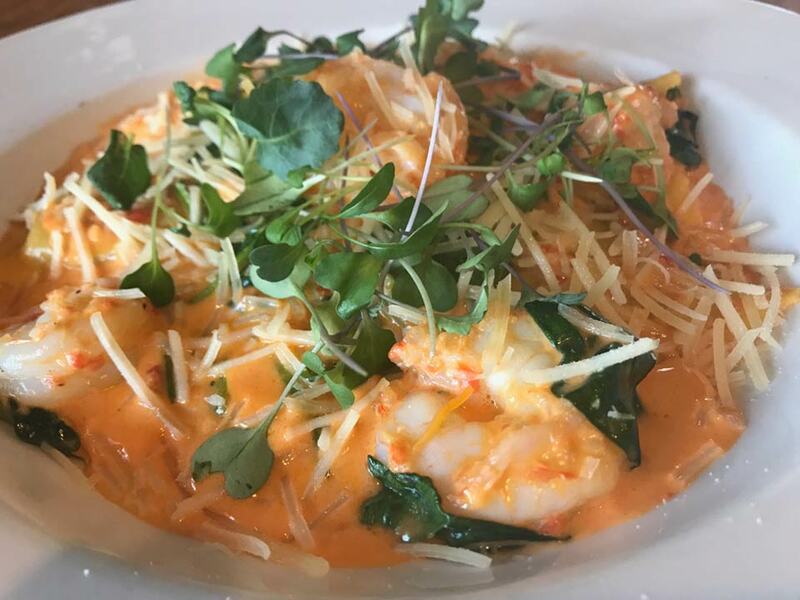 Eckert uses local and fresh ingredients to concoct daily/nightly specials such as a Lowcountry boil or grilled swordfish over tomato, spinach and mushroom risotto with lemon caper butter. The kitchen boasts a large industrial smoker, where they cook their barbecue, highlighted by customer favorites such as mouthwatering brisket. One of their unique items is the smoked prime rib, which is offered on Thursdays from 4 p.m. until closing time. It’s slow-cooked and tender, accented with a hint of smoke flavor. Another signature plate is the Rudder’s skillet mac ‘n’ cheese, which is delivered to your table melty and piping hot in a miniature cast-iron skillet. 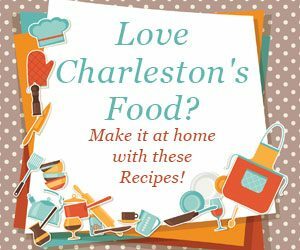 They offer several variations: topped with Charleston hot chicken tenders, mixed with their smoked prime rib, mushrooms and a side of demi-glace or combined with pulled pork or brisket. It is love at first bite with their wings, which, for those of you watching your svelte figure, are smoked and grilled but never fried. Don’t miss half-priced classic burgers for lunch on Mondays from 11 a.m. to 4 p.m., or swing by Tuesday starting at 4 p.m. for a $22 full rack of smoked and grilled ribs. 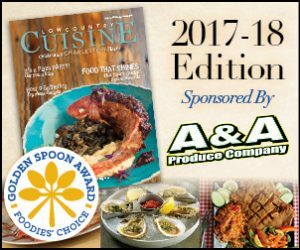 Pair your meal with scrumptious Southern sides, including collard greens, pimento cheese grits, barbecued street corn, grilled asparagus, smashed potatoes and more. While their menu changes seasonally, the staples always remain available. 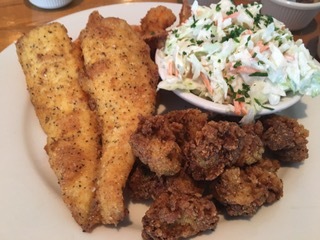 Rusty Rudder is a great option for date nights, family dinners or a quick lunch, and Johnston and Paul pride themselves on making you feel welcome, like you’re one of the family. They are available to host private events on their expansive patio, where they offer live music Thursday through Sunday evenings, weather permitting. 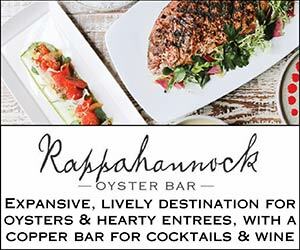 In the fall they also hold all-you-can-eat oyster roasts. Watch your favorite sports games from their inside bar or the tiki bar outside. Rusty Rudder’s hours are 11 a.m. to 10 p.m. Sunday through Thursday and Friday and Saturday from 11 a.m. to midnight. 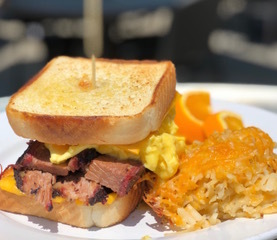 Brunch is served on Sundays from 11 a.m. to 2 p.m. and features all your typical brunch favorites with a Rudder spin, such as a brisket and egg sandwich and barbecued hash. Happy hour is 4 to 7 p.m. Monday through Friday and features $5 house liquors, $3 glasses of house wine and a $1 off domestic bottles. For more information, visit www.rustyruddermtp.com or call 843-388-3177.